Playpen is a 1978 48’ Hatteras LRC hull #36 extended to 53’ (we added 5’ to the cockpit) owned since 1982 by Fred & Sharon Kirsch. We previously have cruised her from as far north as Maine to as far south as Grenada and as far east as Bermuda. We completed the Great Circle Route including the Trent Severn Waterway in 1988. Looking for new adventure after several ICW trips, we shipped her the summer of ’99 on Dockwise Express from Ft. Lauderdale to Vancouver, British Columbia. United Yacht Transport (Dockwise Express) was a terrific experience (a whole ‘nother story). Our motivation to go to the Northwest was to take Playpen on the Northwest LRC cruise led by Lou & Phyllis Scott on Traveler (48 LRC #49). 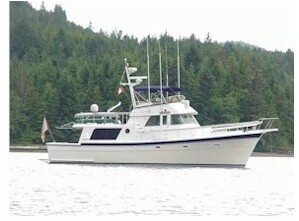 September of 1999 we cruised the San Juan and Gulf Islands before wintering in Anacortes, WA. 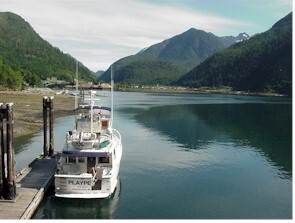 We spent the summers of 2000 and 2001 in the fabulous cruising grounds of Southeast Alaska (yet another wonderful story). In July 2002 we circumnavigated the wild west side of Vancouver Island, and now with 5000 hours under our belts we’re ready for Playpen’s Great Odyssey home to the Wye River on the Chesapeake Bay. We plan to harbor-hop down the west coast of the U.S.,Mexico and the Panama Canal back into the familiar Atlantic. We’re grateful to Ed Hamil for founding our LRC Club. Membership is open to Hatteras LRC owners and those wishing to be with LRC owners. Our next rendezvous is in Baltimore, Sept, 2003. Hopefully we’ll be there with Playpen. We enjoy reading about the adventures of other LRCs in the Caribbean and on the Great Circle and are offering our abbreviated log for anyone who wants to follow us. The April 2001 Passagemaker article on Hatteras LRCs aptly described us as having adventurous spirits and capable, comfortable boats. We couldn’t agree more. Chris Craft in cage to keep the birds out. Mariner’s Basin, Mission Bay, CA Just 10 miles north of San Diego How did I get here? I grew up on Chris Crafts, including hull #1 of the Constellations. 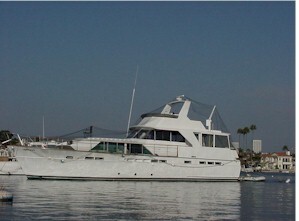 Sharon’s and my 2nd boat was a 52’ Constellation. Owning and working on "Trisha" for 3 years taught us that it takes more than money and sweat to maintain a big wood boat; and it was almost impossible to find good help. Somehow I found myself at Wilkens Hatteras in Annapolis. That visit was to become a major event in my and my family’s lives. We bought a 1977 46’ Hatteras Convertible. Bernie Moyer was our salesman. While looking at the boat I asked Sharon if she liked it; Bernie answered for her, "What’s there not to like?" From that moment on I was destined to meet the most dedicated and knowledgeable people responsible for Hatteras’ success. Bernie knew he had a quality product to sell, and Norman Riker could make anything out of wood or fiberglass that a customer could possible dream up. Norman now runs Riker Custom in Solomon’s MD and does a great job. Stanley Wilkins was so busy coordinating his sales force and commissioning that he rode a golf cart to save time. One of the best things about owning a Hatteras is the Hull # on the boat. You might think all boats have hull numbers; so what’s the big deal. The big deal with my hull # is that I could call the Hatteras factory and when I gave the number to Ray Myers in customer service he could tell me anything I wanted to know about my boat. If he didn’t know the answer to my question he could transfer me to the person who did. Bruce Morrison who built the 48 LRCs is still there today, more than 25 yrs later. As time goes on, even good boats need parts; that’s when I met Steve McPherson.. Steve was in the parts department for 27 years. Sharon and I went to the Norwalk boat show to see the 58 LRC. Mr. Dave Parker, President of Hatteras showed us through. I told him I liked the boat, but liked the dinette in my 48. The next year the 65 LRC had a dinette option for the pilothouse. Now that impressed me! The president cared enough about one of his customer’s input to make a boat with my suggested option. Then along came Dave Champney at Wilkens Hatteras. He wanted to sell me a 65 LRC for $618,000—brand new. I guess trawler people are conservative by nature, and I let that opportunity slip by. Maybe that was a mistake, but my family has enjoyed 25 years of cruising on a Hatteras for several reasons: 1. Continued customer contact by sales people, Dave Champney in the mid-Atlantic and Chris Cunningham in the Southeast. 2. Availability of parts. Steve McPhearson started Sam’s Marine (336-824-6765) when Hatteras combined High Point with New Bern. Steve is a wealth of information as he was manager in the parts department when most of our boats were built. He knows what went into which boat; and if he doesn’t have it, he can usually find it for you. He helped me maintain the Hatteras quality and integrity of Playpen during the extension. With a credit card on file he can deliver anywhere. 3. Customer Service. Ron Lamb is service manager, and Chuck Cameron is his assistant. I go through Chuck because he is a dues-paying member of the LRC Club and writes our newsletter. I’m not sure Hatteras knows how much the LRC Club appreciates Chuck’s attending our meetings. Whenever I have a question or need help with the boat Chuck is just a phone call away. Most of us LRC owners may never buy a new Hatteras unless they start building LRCs again, but we happy owners are still good Hatteras advertising. Hatteras is a highly respected name even on the west coast. Now that I think about it, investing in a good Hatteras was probably better than a lot of other investments—and it’s fun!